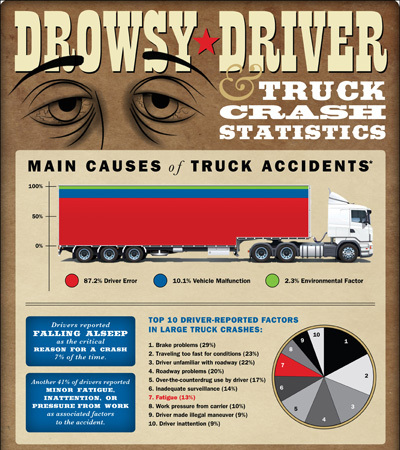 Driver fatigue is one of the leading causes of large truck crashes in the United States. Drivers reported in a 2007 study that fatigue, inattention and pressure from work were associated with their semi truck accidents. As 11% of fatal accidents included a large commercial truck in 2008, and 97% of the deaths were car occupants, this is a sobering statistic that truck drivers and the public need to be aware of. McIntyre Law, P.C. have compiled the following diagram to help the public understand the hours that truck drivers work that can lead to driver fatigue and falling asleep while driving, as well as other causes of large truck accidents. If you or a loved one has been injured in an Oklahoma truck crash, contact the attorneys at McIntyre Law, P.C. to learn more about how we can help you recover from your truck accident injuries. Call 1-877-917-5250 now for a free consultation. Driver fatigue can be caused by lack of sleep, poor quality sleep, interrupted sleep, working night shift, and working rotating schedules. Fatigue results in slowed reactions, poor judgment, and a reduced ability to process information. Truck drivers must follow the following rules when operating a large truck. Maximum 11 consecutive hours driving time. Maximum 14 consecutive hours on-duty. On-duty includes all non-driving activities, such as truck maintenance, loading and unloading, paperwork, etc. Minimum 10 consecutive hours off-duty between driving or on-duty shifts. With these rules, drivers can be on-duty for 60-70 hours each week. The Insurance Institute for Highway Safety claims that these HOS rules – introduced in 2004 – have increased the instances of truck drivers falling asleep at the wheel. Dawson D, Reid K. Fatigue, alcohol and performance impairment. Nature 1997;388:235. FARS (Fatality Analysis Reporting System). National Highway Traffic Safety Administration. Federal Motor Carrier Safety Administration. Freight Facts and Figures 2009. Federal Highway Administration. How Much Sleep Do We Really Need? National Sleep Foundation. Accessed September 2010. Interstate Truck Driver’s Guide to Hours of Service. Federal Motor Carrier Safety Administration. Mitler, M.M. et al. The Sleep of Long-Haul Truck Drivers. The New England Journal of Medicine 1997;333:11. Q&As: Large Trucks. June 2010. Insurance Institute for Highway Safety. The Large Truck Crash Causation Study. 2007. FMCSA. The Truck Safety Coalition. Accessed September 2010. Trucks Involved in Fatal Accidents Factbook 2007. January 2010. UMTRI. View more informative infographics from McIntyre Law, P.C.